People wait in a parking lot along South Moorpark Road in the aftermath of a mass shooting at Borderline Bar on Nov. 8, 2018, in Thousand Oaks, California. Twelve people were killed Wednesday night when a gunman opened fire inside a Thousand Oaks bar. 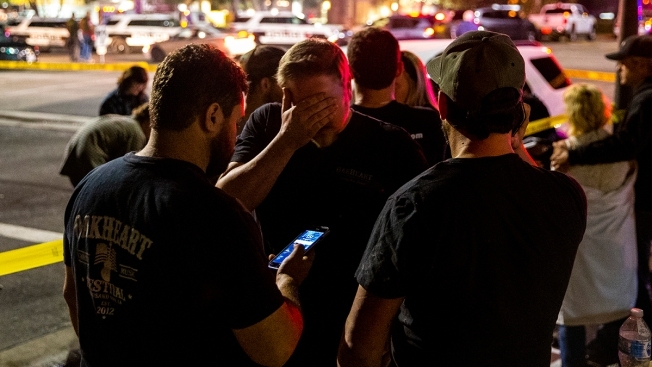 The victims include a 54-year-old Ventura County Sheriff's sergeant who responded to the call for help at Borderline Bar. Victims: Twelve victims are dead, including a 29-year Ventura County Sheriff's sergeant who responded to the scene. Other victims were hospitalized, but details on the injured were not immediately available. Location: The shots were fired during a weekly college night party at the Borderline Bar & Grill at 99 Rolling Oaks Drive in Thousand Oaks. The bar has a large dance hall with a stage and a pool room along with several smaller areas for eating and drinking. An estimated 150 to 200 people were in the bar. Family Unification Center: Families were gathering at 1375 E. Janss Rd, Thousand Oaks. For information, call the hotline at 805-465-6650. It was not immediately clear how many individuals are unaccounted for, but an estimated 50 families were at the center early Thursday. Community Blood Drive: A blood drive was previously scheduled for Thursday as part of a "Day of Service." The drive is located at 106 W. Janss Road, thousand Oaks. More than 200 people were in line Thursday morning. Click here for information. Additionally, another blood drive is open at the Thousand Oaks Inn located at 75 West Thousand Oaks Blvd. Another blood drive is scheduled for Friday morning. Victims Fund: Thousand Oaks officials announced the establishment of the Conejo Valley Victims Fund. It was launched with a $100,000 donation from the locally based Conrad N. Hilton Foundation and $250,000 from the Amgen biotechnology company, which is headquartered in Thousand Oaks. 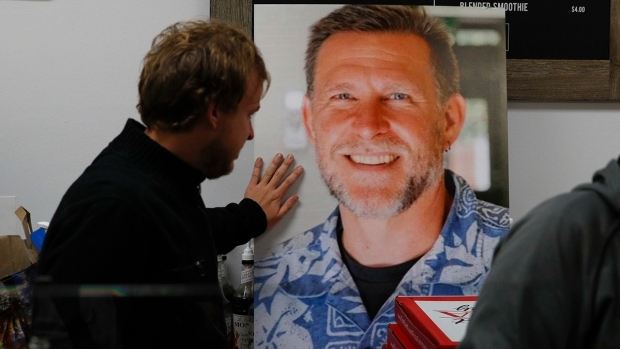 The fund is being administered through the Ventura County Community Foundation. Officials say 100 percent of the funds donated will go to aid victims' families. Remembering the Fallen: A vigil is scheduled for 6 p.m. at Thousand Oaks City Hall in the Fred Kavli Theater. The Los Angeles Archdiocese was to take part in a community prayer vigil at 7:30 p.m. Thursday evening at Saint Paschal Baylon Church, 155 East Janss Road. Heroic Acts of Courage: Sgt. Ron Helus was shot several times in an exchange of gunfire with the attacker as he tried to stop the shooting. There were about six off-duty police officers inside the bar from several different agencies. It appears they took action to protect others and help them escape. Road Closures: Moorpark Road is closed between the 101 Freeway and Rolling Oaks Drive; Rolling Oaks Drive is closed between Moorpark Road to Los Padres Drive; On and off ramps are closed at the 101 Freeway Moorpark Road exit. The Gunman: The shooter, armed with a legally purchased Glock 21 equipped with an extended magazine, was identified as 28-year-old Ian Long, of Thousand Oaks. The Marine Corps veteran, who served from August 2008 to March 2013, was found dead inside the bar by law enforcement officers. It is believed he shot himself. He last attended Cal State Northridge in 2016 and went to Newbury Park High School in Thousand Oaks.